Loved surfs up vacation rental. Super clean, great location. Only recommendation was website did but list a grill and had to email to find out if one available. Also, there were not ratings on Airbnb for this location, which initially had me nervous, but it was great. Spent a week here in July. We had one issue and the staff was very knowledgeable and quickly resolved our problem. When we had to call to have the water heater fixed, they were friendly. I was a bit surprised we werent offered anything for being without hot water for a day. Everything was great except for we could smell dog in the bedding downstairs. Luckily we have dogs, so it wasnt that big of a deal, but it would have been nice to have fresh clean smelling bedding. We had excellent family time and made many memories. We love the home and will be back! We love Manzanita. The location of this house is perfect. So close to the beach and a short bike ride to town and to the state park. Carmel Cottage is a complete treat. 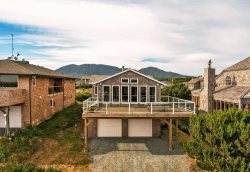 The location is ideal for walking access to the shops and restaurants in Manzanita; and the home is very close to the beach, too. We look forward to our next stay! Everyone was knowledgeable and friendly. Beautiful location. Nice amenities. Beds extremely comfortable. Location good. Setting beautiful. I think I only talked with someone once but they were very friendly. The house is very cute and well maintained. It was just a little to small for our family. Love Manzanita. The king bed was pretty comfortable and the claw foot tub was nice. When we had to call to notify someone about the water we found around the downstairs toilet, the person was very nice and let us know what to do until someone could come take a look at it. We used the property as our "base camp" and did day outings up and down the coast during our stay. The kitchen was large enough for all of us to cook our meals and put together what we needed for each day. The kitchen was actually stocked with more items than other properties we have stayed at in the past. It was perfect! At night the bedrooms were quiet and felt private with so many people in the house. We would highly recommend this property for large groups! Thank you for letting our large group stay - we all loved it! Excellent- so friendly & responsive! Great peaceful & beautiful setting in nature preserve, and loved the short walk to the beach. Also enjoyed that we could walk to town from the house. Wonderful stay, one of our favorites houses weve ever rented anywhere. And definitely our favorite in Manzanita. Very responsive and excellent customer service. No complaints at all. This is our second stay at the house and we loved it just as much the second time. Aside from the enormous house spider that crawled onto my shoulder on the first night, we had a lovely stay and look forward to staying there on future visits. Thank you! The Carmel House was perfect for our time in Manzanita. The house was described perfectly. There were no surprises.The property was clean and well kept. Thank you for all the efforts to make our stay great! Loved that it was close to the ocean/beach and to walk in town for shops, groceries and restaurants. Great holiday! Wow - what can we say - you saved the day! Thank you so much for saving our vacation - without your help we honestly don't know what would have happened - probably a 6 hour drive home. We are so grateful to you, especially our family (and granddaughter) we had a wonderful week and we are already planning on coming back and will come straight to you for our accommodation. Your kindness and help will always be remembered - thank you. A couple of points regarding the house - the dryer does not fully work on the high setting, it works fine on auto dry, and low dry. Also the mattress in the main bedroom needs replacing - the side nearest the door has lost all support (the other side was fine). Oh and I think I left my charger in the living room ? black - Asus computer lead. They were all professional and very helpful! We loved our stay and would highly recommend this property to anyone. Fun was had by all as we enjoyed this beautiful home. It has so much character and good karma inside. It was very evident it was made with love from a very nice family who have filled it with many years of fun memories. Also, we appreciate allowing our little chihuahua Lola to come, too. She's a mellow good girl and trips aren't the same without her. Thank you for letting us make memories of our own in your wonderful home. We loved staying at the Cedar House in Manzanita. It was cozy and felt like home. Next time we will stay longer, two days was not enough! FAVORITE FEATURE: I loved the kids bedroom. It was decorated and stocked with toys, so the kids had plenty to do. I also really loved the selection of board games. Only email contact. Didn't need anything else. All the instructions were very clear. We stayed in this home with two families for a short visit! What an amazing time we had. The home was perfect for our group of 10. It had all the amenities we could ask for and more. We were in want for nothing. We will definitely choose this home again in the future!